We’re launching a brand new CAN BUS LOAD course, and we want to extend you a special invitation to check it out as soon as it’s out. Fill out your details here, and we’ll send you a completely free first lesson of the course we release it in the next few days! 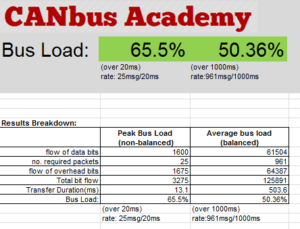 The CAN bus load calculator is a useful tool to estimate utilization of the network. Proper analysis before the design of a communication system avoids problems down the road. In an existing CAN implementations, using such load estimator can uncover potential problems and is a useful troubleshooting tool. A conservative recommendation is that average bus load should be below 80%. In an application where the bus load is above 80% there’s a higher risk of message conflict between CAN nodes that result in a dropped message. Dropped messages have the potential for slowing system controls and in extreme cases causing device time out faults. Hence analysis is recommended. This calculator lets you enter several parameters to estimate the load. You can adjust add as many as 40 messages and their transmission rates, datalink baud rate (125Kbps, 250Kbps or 1Mbps) and protocol type (11bits and 29bit protocol). The output of the calculator is the Peak load and the Average load. Interpreting those numbers will give you an excellent indication of the actual load when you actually build the network. Enter your email to download the Excel spreadsheet.